Transfer the mango, 2 tablespoons honey and juice of a lime to a blender. Blend till a puree is formed. Keep aside. In the meantime, whip the heavy cream with 1 tablespoon honey and vanilla extract till peaks form. Take ½ of the cream out and fold in the mango puree into the remaining cream. Fold well and transfer into 4 glasses. 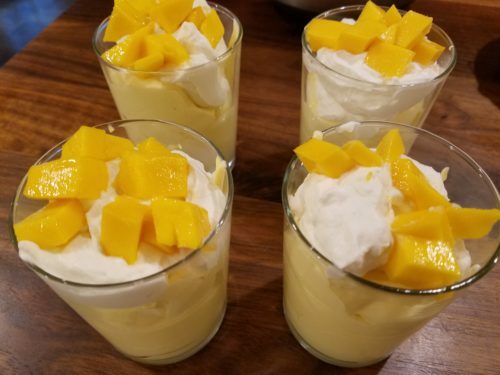 Top with whipped cream and garnish with fresh mango. Mix agave, oil, vanilla and eggs. Beat the mixture in an electric mixer for 2 to 3 minutes. Add almond flour, cocoa, baking soda, salt and cinnamon. Stir to till smooth. Pour into pan and bake till the done- about 15 minutes. 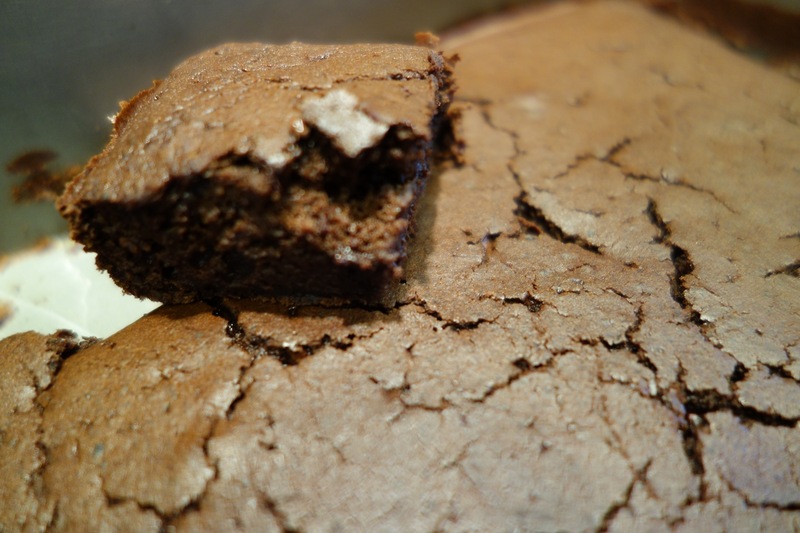 Brownie- take 2- I changed it up this time with coconut oil and coconut sugar. My daughter gave it a thumbs up. You can have some without thinking twice.. good for you and delicious!! Coat an 8 X 8 baking pan with some oil and keep aside. Preheat oven to 350 degrees F.
Add the beans to a large food processor and add the oil. Process till smooth. Add the eggs, coconut sugar, cocoa, vanilla extract, baking powder and salt. Process till everything is incorporated and smooth. Take the bowl off the processor and add the grated chocolate and mix with a spatula. Pour the mixture into the pan and bake for 25 to 30 minutes till knife comes out clean. Add the beans to a large food processor and add the oil. Process till smooth. Add the eggs, cane sugar, cocoa, vanilla extract. almond extract, baking powder and salt. Process till everything is incorporated and smooth. Take the bowl off the processor and add the grated chocolate and mix with a spatula. Pour the mixture into the pan and bake for 25 to 30 minutes till knife comes out clean. 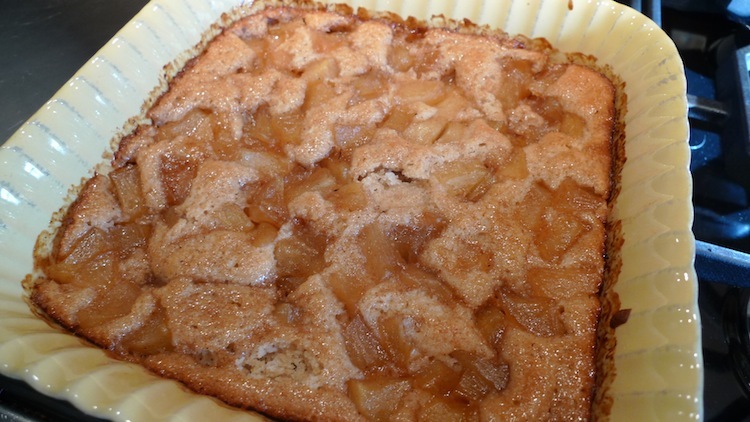 Stir together 1/3 cup sugar with apple cider, lemon juice and cornstarch in a small saucepan, then stir in the apples. Bring to a simmer and continue to simmer, stirring occasionally about 10 minutes. Remove from heat. 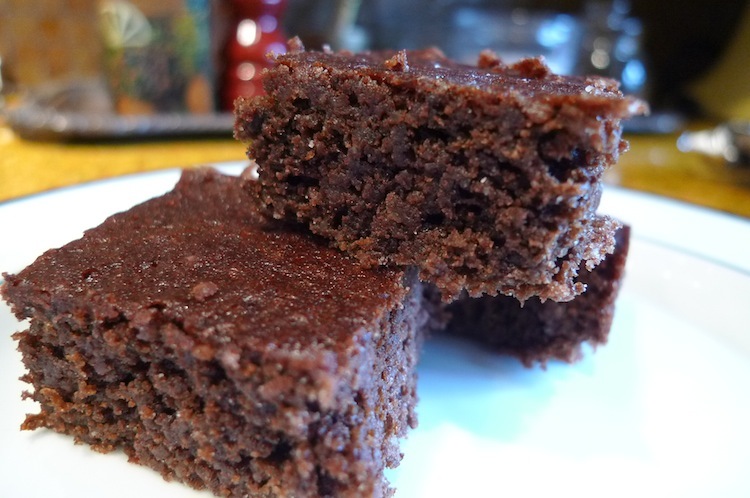 Whisk together flour, baking powder, cinnamon, cloves, nutmeg, salt and remaining ½ cup sugar in a medium bowl. Whisk together egg, cider, oil and vanilla in a large bowl. Add the flour mixture- whisk till combined. Spoon the batter into baking pan spreading evenly. Then pour apple mixture evenly over batter. Bake for 25 to 30 minutes or till cake is done. Whip the cream in a standing mixer till soft peaks form. Add the sugar and pumpkin puree. Whip for another minute and chill for an hour before serving with cake. Place the butter in a large frying pan. Add the apple pieces, cinnamon stick, cardamom seeds and sugar. Stir constantly until the butter melts on a medium heat. Add the cider and lemon juice and bring to a boil. Lower the heat and cover with lid for ten minutes or till the apple pieces are soft but not mushy. Bring to room temperature and refrigerate. Take out of fridge a few hours before assembling. Divide into two portions. In a medium saucepan, heat the milk and vanilla bean to a boil over medium heat. Immediately turn off the heat and set aside to infuse for 10 minutes. In a bowl, whisk the egg yolks and granulated sugar until light and fluffy. Add the cornstarch and whisk vigorously until no lumps remain. Whisk in ¼ cup of the hot milk mixture until incorporated. Whisk in the remaining hot milk mixture, reserving the empty saucepan. Pour the mixture through a strainer back into the saucepan. Cook over medium high heat, whisking constantly, until thickened and slowly boiling. Removed from and heat and stir in butter. Transfer to a storage bowl. Cover with plastic wrap to eliminate skin forming. Refrigerate overnight. Divide into two portions. 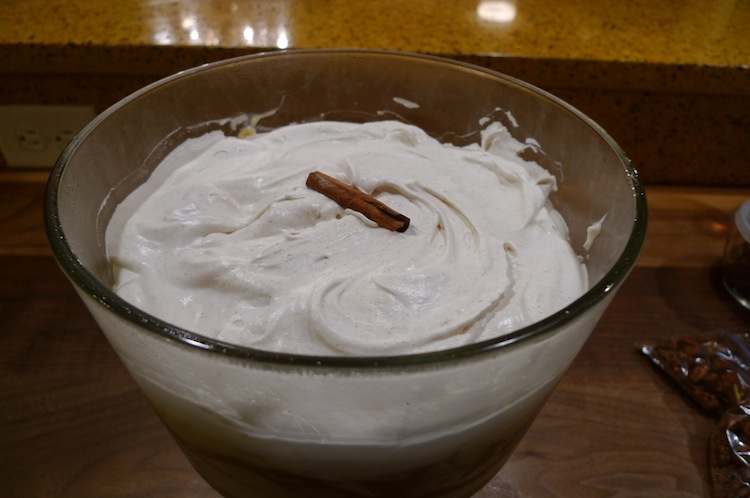 Whip the mascarpone cheese, whipped cream, sugar and cinnamon till stiff peaks form. Assemble the trifle by starting with a layer of pound cake at the bottom. Cover with one portion of the apples and then the custard. Repeat the process one more time and top with cinnamon whipped cream. Refrigerate for at least 4 to 5 hours before serving. Grease and flour a 9” round pan. In a medium mixing bowl, sift the flour, baking powder, baking soda, salt, cinnamon and nutmeg. In a large bowl of a mixer, add the melted chocolate and the oil. Add sugar and beat until mixture is creamy. Beat in eggs, one at a time, then add the applesauce and vanilla and mix well. Stir in dry ingredients and pour into the round pan. Bake for 35 to 40 minutes or until tester is clean. Let cool and then top with the spiced icing. In a small mixing blow, combine the sugar, cocoa, cinnamon, nutmeg and milk. Whisk well until all ingredients are incorporated and smooth. Add more milk if needed to reach the desired consistency. 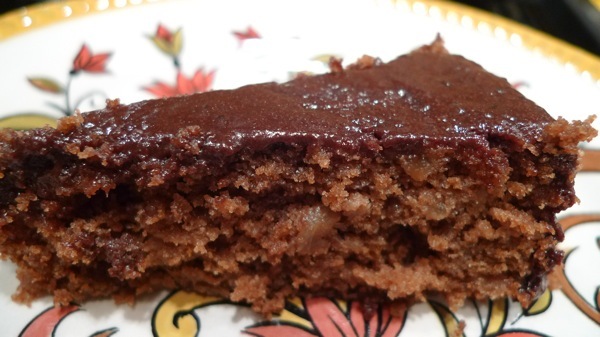 Pour on top of the the cake and spread to the sides evenly.